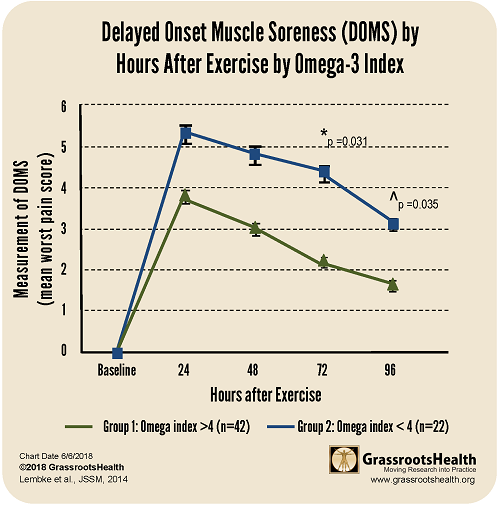 A study by Lembke et al., “Influence of Omega-3 (N3) Index on Performance and Wellbeing in Young Adults after Heavy Eccentric Exercise,” compared the Omega-3 Index of subjects with the incidence of DOMS, which for each participant was measured on a visual scale of 1-10 at 0, 24-, 48-, 72-, and 96 hours post-exercise. Delayed onset muscle soreness is characterized as a type of soreness that is usually caused by a new or unaccustomed exercise. The onset of DOMS generally occurs within 24-48 hours following exercise, may be associated with swelling, tenderness and discomfort, and may be experienced up to 1 week following heavy exercise. Healthy men and women over the age of 18 who were not currently taking any dietary supplements containing fish oil or omega-3 were allowed to participate in the study. 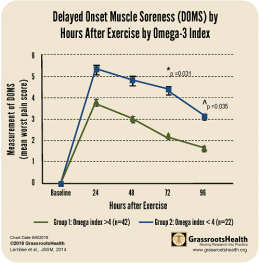 Study subjects were given either an omega-3 dietary supplement (2.7 g EPA+DHA) each day (Group 1) or a placebo each day (Group 2) with food for 30 days prior to exercise. After 30 days of supplementation, Group 1 (N=42) moved from an initial average Omega-3 Index of 3.6 up to 5.4 as measured at the start of the exercise portion of the intervention. After 30 days of placebo, Group 2 (N=22) moved from an initial average Omega-3 Index of 3.8 to 3.9 as measured at the start of exercise.